Like 2013, the 2014 season was a tale of two sides of the game. On the field, the game was as strong as ever, while off the field the code was marred by the ongoing Essendon/ASADA saga, the unpopular ticketing system, and the persistent inconsistency and confusion over the Match Review Panel’s weekly rulings. Unfortunately many will remember this season for the wrong reasons, yet I believe there is much to be positive about. Fans might argue that the persistence of ‘rolling mauls’ are a blight on the game, yet this is overstated. With Hawthorn’s sharp foot skill, Geelong’s attacking style, Sydney’s power forward line, Port Adelaide’s speed, and even Richmond’s never say die attitude, there are clubs flying the flag in support of good footy; and hey, Ross Lyon’s defensive, stingy game plan has still never won a side a premiership, so we shouldn’t get too worried. Port Adelaide were still in prime form at this stage, and the Swans were aiming for a ninth straight win. This match had it all. 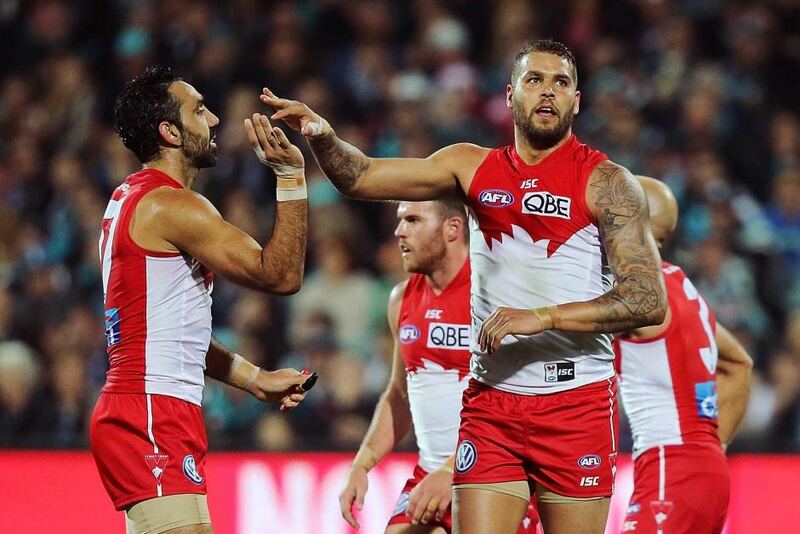 Buddy Franklin provided two magic goals in the final quarter to seal the match for the Swans in front of the third largest AFL crowd in history at the SCG. Side note: The Sydney preliminary final attracted 48,029 fans. This eclipsed the corresponding NSW NRL finals in the same week. Who said footy couldn’t dominate Sydney? Easter Monday, huge crowd, two great sides, Tom Hawkins dominating – what more could you want? There’s not much more that can be said about this guy that hasn’t been said already. All the superlatives fit. He would have to be the most consistent player in the history of the game. Lance Franklin might excite, but Ablett can both excite and consistently provide close to 40 effective disposals week-in week-out. The argument is now where Ablett sits among the best of all time. This guy is the quintessential footballer. Courageous, skillful, determined, and tough. He is the perfect captain. I would argue that he helped carry Geelong into the top four this year. To the haters out there, and there are many, I’ll remind you what we’re all taught in junior footy: the player who is first to the ball will win the free kick. They may have made the finals after a remarkable nine match winning streak, but that shouldn’t take the spotlight off the fact that their season did not live up to expectation. The next step for Richmond was supposed to be a top four finish, since they did notch up 15 wins during 2013. The test was out there – can the Gold Coast perform without the little master at the helm during the final seven weeks. A string of losses and a missed finals spot gave the obvious answer: a resounding no. Should have won the NAB Rising Star (no disrespect to Lewis Taylor – stellar first season). But Bulldogs fans have much to look forward to in the coming years. Bontempelli will be a star, but they also have much to like about Jack Macrae, and now Tom Liberatore has come into his own as an elite midfielder. Watch the doggies propel into the top eight in 2015. This guy will be a star. Any first year player to shine in the finals like this bloke has got many years of good footy ahead. As if Hawthorn needed another gun. Essendon/ASADA/WADA/Hird/Dank/Peptides/over it/sort it out/move on/had enough. Brenton Sanderson getting the sack. It’s alright mate, a club that lets its senior players dictate the terms is a club so arrogant in itself it will only fall down the ladder. I hope they have a good replacement sorted out, and god help him if the precious players don’t like him. I say surprise packet, but we shouldn’t really be surprised since they have been pressing for so long. They have the right mix of speed and talent up forward, yet what’s been lacking is the mental toughness to mix with the game’s best. 2014 and the finals series in particular may have put an end to the doubts. That said, who can really predict where they will go during 2015? They are that sort of club. Matthew Priddis winning the Brownlow. Did anyone see this coming? Even Priddis. The bookies didn’t, and don’t they love it! The game will be close for the first half and a bit, before the Swans will power away. The Hawks are a brilliant side, perhaps one of the most skillful that the game has seen. Yet stopping a forward line with the following names: Goodes, Franklin, McGlynn, Tippet – a tough ask. Sydney have been the best team all year, and on the last Saturday in September that will be confirmed. I wrote this already, but I expect the doggies young guns to fire (more so) next year. Last week’s VFL premiership win only confirmed that the bulldogs have a few good years coming their way. Welcome back to the eight boys. A disliked coach, player discontent, potential loss of key players. Sorry bombers fans, but 2015 is looking like a good time to take a six month trip around the world while your boys battle it out – because battling they’ll be.